Public spending on education was 8.4% of GDP in 2007. The Ministry of Education and Culture is responsible for lifelong education and training and coordinates provision between the government, donors, NGOs and the communities. Higher education is funded by the state but universities have a high degree of autonomy (in administration and finances) and coordinate their actions with the Higher Education Council (Conselho do Ensino Superior). Their internal governing body is the University Council (Conselho Universitário), which is composed of the rector and the deans of the faculties. There are seven years of compulsory education starting at the age of six. Primary school comprises seven years and secondary five, with cycles of three and two years. Some 31 per cent of pupils complete primary school (2011). The school year starts in January. Tertiary education is provided at Universidade Eduardo Mondlane (in Maputo); Universidade Pedagógica (Maputo, with branches in Beira and Nampula); Instituto Superior de Relações Internacionais (Maputo); and Universidade Lúrio (established in 2006, with campuses at Nampula, Pemba and Niassa, in the three most northerly provinces). 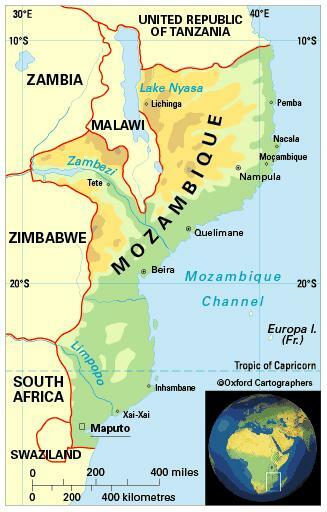 Private tertiary institutions include the Higher Polytechnic and University Institute (1996, Maputo, with a branch in Quelimane); Catholic University (1997, Beira); and Higher Institute for Science and Technology of Mozambique (1997, Maputo). The female-male ratio for gross enrolment in tertiary education is 0.6:1 (2011). Literacy among people aged 15-24 is 72 per cent (2010).